Interstate 129 crosses the Missouri River between Sioux City, Iowa, and southern reaches of South Sioux City, Nebraska. The freeway is cosigned with U.S. 20 and 75 for its short distance. The freeway spans the Missouri River across the Sergeant Floyd Memorial Bridge, a 2,607 foot long steel plate girder bridge. The bridge accommodates four lanes of travel with a 79 foot deck at a height of 64 feet above the river. We received your comment concerning the use of the interstate shield for I-129 for southbound traffic and the use of letter text for I-129 for northbound traffic on I-29. Approximately 10+ years ago some motorists were getting confused with I-129 signing, thinking it was I-29 and taking the off ramp to US75 to Nebraska when they really wanted to stay on I-29. We thought we would try using the letter text I-129 to make it stand out different from the interstate shield of I-29. Since then we have had a signing project on southbound I-29 and changed the letter text I-129 back to the interstate shield and have had no complaints or concerns that I’m aware of. The northbound signing on I-29 will be reviewed when we put our next project together. All text-based signs for I-129 were replaced by June 2015 with the exception of a remaining panel over the southbound ramp split of Exit 144. Interstate 129 was never extended north and the I-429 proposal never came to pass. The U.S. 75 freeway defaults motorists onto the divided highway leading northeast to Hinton and Le Mars. The US route in conjunction with Iowa 60, Minnesota 60 and U.S. 59 provides an expressway grade corridor to Worthington, Minnesota and Interstate 90. 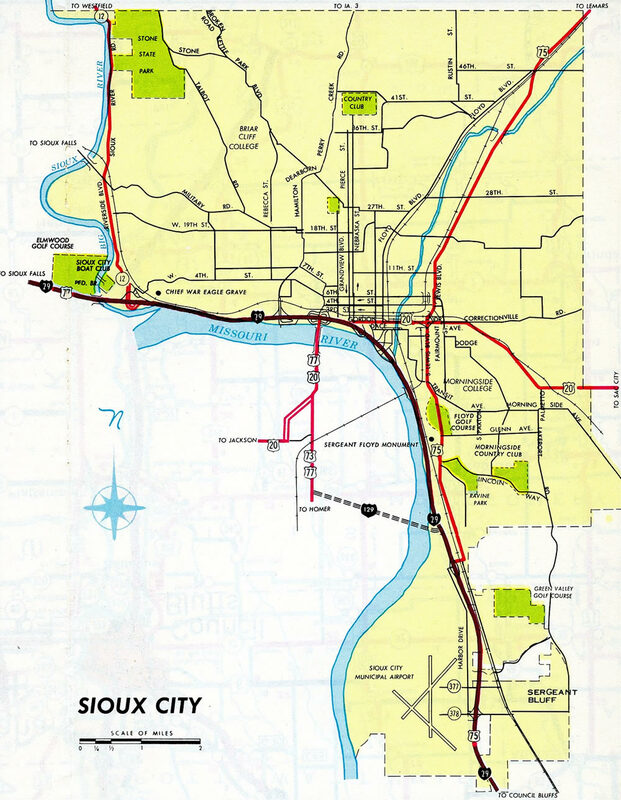 The completion of Interstate 129 led to the eventual relocation of U.S. 20 to bypass Downtown Sioux City and South Sioux City. This alignment is now a part of U.S. 20 Business, with the exception of the stretch along Dakota Avenue (former U.S. 73 & 77), which carries the business route south to I-129. 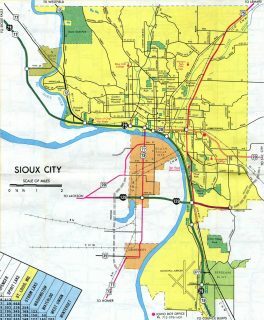 The expressway alignment of U.S. 77 was the eventual end point of Interstate 129 on the 1977 Iowa Official Highway Map. U.S. 73 was dropped from Winnebago, Nebraska northward to Sioux City on December 6, 1984. This left U.S. 77 to travel solo to its north end at Interstate 29 in Downtown Sioux City. Passing over Dakota Avenue, which is a poorly signed Business route for U.S. 20, drivers along I-129 & U.S. 20-75 see a button copy sign on the two mile approach to Interstate 29. Photo taken 06/17/15. Interstate 129 bends slightly southward across agricultural areas preceding the Missouri River. Forthcoming Interstate 29 is the first of five exits signed for Sioux City, Iowa along U.S. 20 east. Photo taken 06/17/15. Crossing the Sergeant Floyd Memorial Bridge, eastbound travelers enter Woodbury County, Iowa. Exit 1A departs from midspan for Interstate 29 south & U.S. 75 Business north. U.S. 75 Business uses the freeway south to Singing Hills Boulevard east to overtake Lewis Boulevard northward into Sioux City. Photo taken 06/17/15. Interstate 29 straddles the east banks of the Missouri River northward from Exit 1B to Downtown Sioux City. I-129 ends as U.S. 20 & 75 remain east along the city belt route for another 3.7 miles. Photo taken 06/17/15. Sign changes made after 2012 replaced this set of guide signs at Exit 1A to use Clearview font. 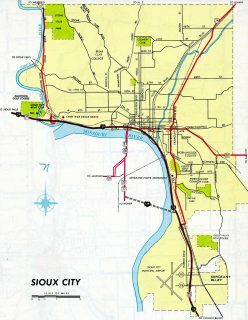 Sioux Gateway Airport was added below Council Bluffs for I-29 south. Photo taken 04/20/07. The overhead for I-29 north was also replaced after 2012. U.S. 20 east remains a freeway or expressway for much of its journey across the northern tier of Iowa. Photo taken 04/20/07. A close-up of the former end Interstate 129 shield along eastbound at Exit 1B. This sign was removed by 2015. Photo taken by Jeff Royston (03/16/05). Interstate 29 Improvement Project work upgrading Interstate 29 to six lanes south of Interstate 129 was underway by August 2010. The work reconstructed the diamond interchange (Exit 143) with U.S. 75 Business (Singing Hills Boulevard). This set of signs for Interstate 129 and U.S. 20-75 removed and later replaced with Clearview font based signs. Photo taken 04/20/07. Exit 144A follows onto U.S. 20 east & 75 north along the Sioux City belt route freeway. Text based signs for Interstate 129 were implemented in 2001 and removed during the Interstate 29 Improvement Project. The northbound freeway is now four lanes wide here. Photo taken 04/20/07. This set of bridge mounted signs were taken down and replaced with overheads mounted to a sign bridge. The westbound beginning of Interstate 129 crosses the Missouri River along a steel girder bridge. Photo taken 04/20/07. The Segment 1 project of the overall I-29 Improvement Project through Sioux City rebuilt the freeway to six overall lanes with a barrier median on the stretch leading south to Interstate 129 and U.S. 20-75. New signs were installed in 2015 as the project neared completion. Photo taken 06/17/15. Interstate 29 maintains three through lanes southward to Sioux Gateway Airport (SUX) and Sergeant Bluff. Two lanes depart otherwise for Interstate 129 west to South Sioux City, Nebraska and U.S. 20 & 75 northeast along the Sioux City belt route. Photo taken 06/17/15. U.S. 20 east connects Sioux City with Fort Dodge and Waterloo while U.S. 75 heads northeast to the Plymouth County seat of LeMars. The pair overlap with Interstate 129 west across the Sergeant Floyd Memorial Bridge. Photo taken 06/17/15. The lone remaining sign referencing Interstate 129 in text appears on the transition ramp of Exit 144 to Interstate 129 and U.S. 20 & 75. All signs posted along I-29 used this format in 2001. Photo taken 06/17/15. Replacement signs posted along Interstate 29 south at Interstate 129 when the freeway was still just four lanes wide. Photo taken by Jeff Royston (03/18/05). Lowering from the bluffs east of the Missouri River, the U.S. 20 & 75 freeway sees an auxiliary lane from the Lakeport Street on-ramp to the unnumbered exit for Interstate 29. I-129 is not acknowledged on any signs posted in this direction. Photo taken 06/17/15. All traffic bound for Interstate 29 departs in unison as U.S. 20 west & 75 south enters a cloverstack interchange. Interstate 129 begins the short trek across the Missouri River to South Sioux City here. Photo taken 06/17/15. U.S. 75 Business passes below as drivers partition into ramps for Interstate 29 south to Sioux Gateway Airport (SUX) and Council Bluffs and north back to Downtown and Sioux Falls, South Dakota. Photo taken 06/17/15. These former signs directed motorists along the transition ramp to Interstate 29. Note the remnants of a U.S. 75 north shield assembly on the southbound I-29 panel. This reflected the pre-2001 routing of U.S. 75 through Sioux City. Photo taken 04/20/07. The final interchange on Interstate 129 west is the full cloverleaf interchange (Exits 1B-A) with U.S. 77. U.S. 75 will depart the freeway south along side U.S. 77 toward Winnebago. Photo taken 06/17/15. U.S. 77 north travels into Sioux City, Iowa, where it ends at Interstate 29 (Exit 148). Photo taken 06/17/15. Exit 1B departs I-129-U.S. 20 west & U.S. 75 south for U.S. 77 north. The controlled access expressway U.S. 77 takes bypassed an alignment along Dakota Avenue (U.S. 20 Business) west of Dakota City and South Sioux City. Photo taken 06/17/15. Non reflectorized signage at Exit 1A reflected the renumbering of U.S. 73 to U.S. 75 made in 1984. U.S. 75 overtook all of U.S. 73 south to Omaha and Dawson. Photo taken 06/17/15. An end sign for Interstate 129 stands just west of the Lake Avenue underpass. U.S. 20 continues as an at-grade expressway six miles to Jackson. Photo taken 06/17/15. This end Interstate 129 sign was previously posted just west of U.S. 75 and 77. It was replaced with a shield assembly by 2007. I-129 is one of those rare branch routes that enters a state that its parent route does not enter. Photo taken by Jeff Morrison and Jason Hancock (06/12/05). U.S. 77 angles southwest between an industrial park and Crystal Cove Park to meet Interstate 129 and U.S. 20-75 at the Kingsbury Interchange. Photo taken 06/17/15. U.S. 20 leads motorists west 18 miles to the Dixon County seat of Ponca via Nebraska 12. Interstate 129 accompanies the US route east to Interstate 29. Photo taken 06/17/15. A trailblazer remains for U.S. 75 north as drivers loop away from U.S. 77 south to Interstate 129 east. Overheads for I-129 east on U.S. 77 were replaced in 2007 to finally reflect the 1984 relocation of U.S. 75. Photo taken 06/17/15. The center non reflectorized sign for I-129 & U.S. 20 east was replaced later in 2007 to show U.S. 75 north. The control point remains Iowa. Photo taken 04/20/07. U.S. 75 south departs from I-129 & U.S. 20 west to overlap with U.S. 77 south to Homer and Winnebago. Photo taken 04/20/07. Leading north from the Fairgrounds area, U.S. 75 & 77 approach the Kingsbury Interchange with Interstate 129. Merle Kingsbury was a member of the Nebraska Highway Commission member from 1953 to 1987. He oversaw many of the public hearings involving the location of Interstate 80 across the state.6 Photo taken 06/17/15. A third lane opens from the Fairgrounds access road to the eastbound on-ramp for Interstate 129 & U.S. 20. U.S. 75 accompanies the freeway east across the Sergeant Floyd Memorial Bridge into Sioux City, Iowa. Photo taken 06/17/15. U.S. 20 & 75 overlap east for 7.3 miles along the Sioux City belt route to the east end of U.S. 20 Business. U.S. 77 ends 3.7 miles to the north at Interstate 29 and Wesley Parkway outside Downtown Sioux City, Iowa. Photo taken 06/17/15. This guide sign was replaced later in 2007 to reflect the overlap of U.S. 75 north on I-129 & U.S. 20 east. Photo taken 04/20/07. A reflectorized overhead replaced the sign for Interstate 129 & U.S. 20 east to also include U.S. 75 north. The section of U.S. 75 south from Sioux City in Iowa was decommissioned in 1984. Photo taken 04/20/07. U.S. 20 upgrades to a freeway east of the intersection with Elgin Avenue. The full cloverleaf interchange (Exits 1A/B) with U.S. 77 and U.S. 75 south lies one mile ahead. Photo taken 06/17/15. U.S. 75 & 77 overlap 16 miles south from Interstate 129 & U.S. 20 to Winnebago. The two travel rural routes south to Decatur and Oakland respectively. Photo taken 06/17/15. Interstate 129 begins as motorists along U.S. 20 east reach the southbound off-ramp (Exit 1A) for U.S. 75 & 77. Fairgrounds references the site surrounding the former Atokad Park just to the southeast. Photo taken 06/17/15. U.S. 77 travels along a commercialized route north to Klasey Park and Dakota Avenue. Dakota Avenue leads the route north to the Siouxland Veterans Memorial Bridge across the Missouri River into Iowa. Photo taken 06/17/15. Replaced button copy sign posted one mile ahead of the U.S. 20 transition to Interstate 129 at U.S. 75 and 77. A label scar hints at Atokad Park, a horse racing facility that closed in 2012 and was later torn down. Photo taken by Jeff Morrison and Jason Hancock (06/12/05). Interstate 129 Sergeant Floyd Memorial Bridge Dedication. N.p. : Siouxland Interstate Metropolitan Planning Council, 1976. Print. “Highway opens to traffic.” Sioux City Journal (IA), November 20, 2001. Henjes, Jeff “I-129 Loop.” Online posting. July 25, 2000. news misc.transport.road. “Governors consider infrastructure requests.” Sioux City Journal (IA), July 26, 2000. “50 Years of Interstate – Nebraska and the Nation.” http://nlc1.nlc.state.ne.us/epubs/R6000/T040-2006.pdf Nebraska Department of Roads, June 29, 2006.